NASA’s New Horizons team celebrated what would have been dwarf planet Pluto discoverer Clyde Tombaugh’s 109th birthday by releasing new photos of Pluto and Charon orbiting each other, taken by the spacecraft for optical navigation purposes on Feb. 4. 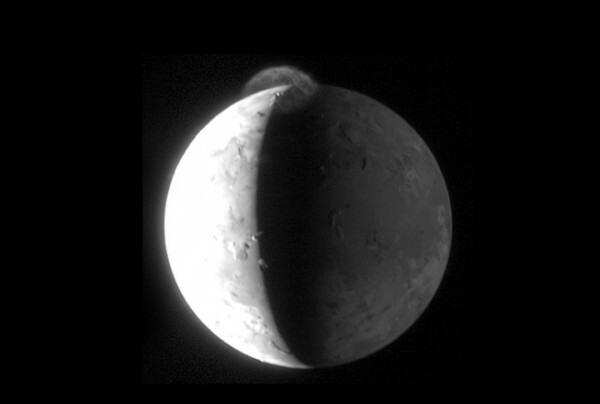 These images also serve to mark the spacecraft’s approach to and flyby of the tiny world and its fleet of moons. The two images were captured by the Long Range Reconnaissance Imager (LORRI ), a panchromatic high-magnification imager on Jan. 25 and 27, at the start of the mission’s Approach Phase 1. LORRI consists of a telescope with an 8.2-inch (20.8-centimeter) aperture, focusing visible light onto a charge-couple device. The first image was taken at a distance of 126 million miles (203 million km) from Pluto and the second from 1.5 million miles (2.5 million km) closer. 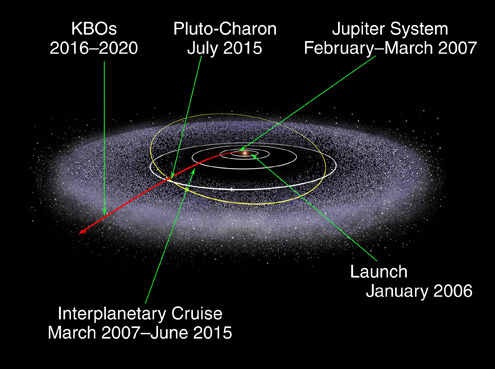 These pictures are the first of hundreds LORRI will capture against a background of star fields for navigational purposes.Known as “OpNavs,” the long-distance images will enable navigators to determine whether any course-correction maneuvers are necessary to keep the spacecraft on a precise journey to and then through the Pluto system. One such maneuver has already been scheduled for Mar. 10. Pluto takes up two pixels while Charon takes up only one pixel in LORRI’s field of view. To make both objects more visible, the images taken were magnified four times. With an exposure time of only one-tenth of a second, Pluto’s smaller moons are not visible. Two of those moons, Nix and Hydra, will be visible in later images LORRI plans take with exposure times up to 10 seconds. The mission chose to pay tribute to Tombaugh, who was born on Feb. 4, 1906 and discovered Pluto in 1930, by publishing the new images on his birthday. “This is our birthday tribute to Professor Tombaugh and the Tombaugh family, in honor of his discovery and life achievements–which truly became a harbinger of 21st century planetary astronomy,” noted Principal Investigator Alan Stern of the Southwest Research Institute in Boulder, Colorado. A short video on New Horizons’ website features an interview with Tombaugh’s son Alden and daughter Annette. Tombaugh, who died in Jan. 1997 only weeks before his 91st birthday, also discovered 15 asteroids, Comet 274P/Tombaugh-Tenagra, hundreds of variable stars, several star clusters, several galaxy clusters, and a galaxy supercluster. “When he looked at Pluto, it was just a speck of light. To actually see the planet that he had discovered and find out more about its atmosphere, find out more what it is and actually get to see the moons of Pluto–he would have been astounded,” daughter Annette Tombaugh-Sitze said. “And I’m sure to have the planet that you discovered better defined, better understood–it would have meant so much to him,” she stated. “He would be absolutely delighted with the fact that finally, we were getting the ability to determine what the composition of Pluto was, why its orbit is what it is, what other objects act on it, and the objects that surround it in the Kuiper Belt,” Alden Tombaugh said. Only 24 when he discovered Pluto at the Lowell Observatory in Flagstaff, Arizona, Tombaugh went on to a distinguished career as a professor at New Mexico State University, where he founded an astronomy department and taught from 1955 until 1973. While he did not live to see New Horizons’ launch, Tombaugh was aware of efforts to send a spacecraft to Pluto. Jet Propulsion Laboratory (JPL) researcher Robert Staehle in 1992 asked Tombaugh for permission to visit Pluto. 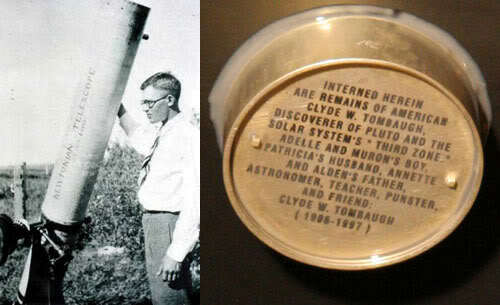 A portion of Tombaugh’s ashes are onboard the spacecraft, in a container on its underside. “I told him he was welcome to it though he’s got to go on one long, cold trip,” Tombaugh told him. For many years, Pluto was thought to be larger than it actually is because observers did not realize they were actually looking at two objects. Charon, Pluto’s largest moon, was not discovered until 1978. It is half Pluto’s size and separated from the planet by a mere 12,160 miles (19,570 km). The two objects are tidally locked, always presenting the same face toward one another, and orbit a center of gravity outside of Pluto, leading some scientists to consider Pluto-Charon as a double planet system. 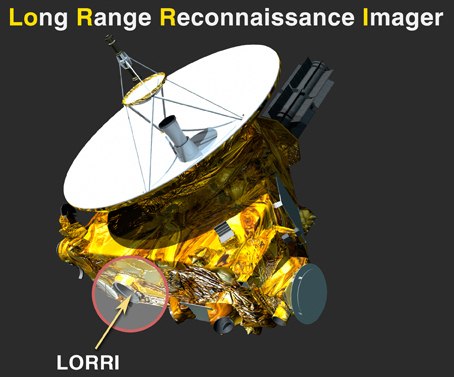 Animations of New Horizons’ images show the two objects orbiting each other. As New Horizons closes in, pictures of Pluto and its large moon Charon will grow larger and clearer, Weaver noted. In May, two months before its closest approach to the planet, the spacecraft will begin sending back images with a higher resolution than those taken by the Hubble Space Telescope. Hubble’s first, blurry pictures of Pluto were taken in the 1990s. Later Hubble images led to the discovery of four additional Plutonian moons. Nix and Hydra were found in 2005, and two more satellites were discovered after New Horizons’ launch, Kerberos in 2011 and Styx in 2012. “The quality of the latest images confirm LORRI is performing just as well as it did when New Horizons launched nine years ago,” Weaver said. Launched in Jan. 2006, New Horizons has already traveled three billion miles over the past nine years. The fastest spacecraft ever launched, it reached Jupiter and imaged the giant planet and its moons in Feb. 2007. 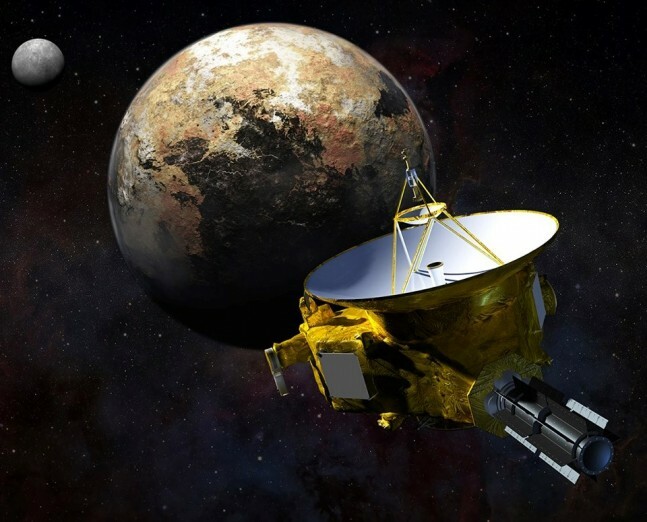 Now heading to Pluto at a speed of 31,000 miles per hour, New Horizons has seven instruments, including LORRI, which will take measurements of the solar wind, dust, and energetic particles in Pluto’s region, study the planet’s atmosphere, and map its surface. Pluto’s composition is estimated to be 70 percent rock. Its temperature is about 43 Kelvin (-230 degrees C), and it has a thin atmosphere of nitrogen, methane, and carbon monoxide. Hubble images indicate the planet experiences seasonal changes. From spectroscopic analyses, researchers have determined its surface is composed of 98 percent nitrogen ice, along with tiny amounts of methane and carbon monoxide. The small world could harbor a subsurface ocean and possibly even geysers such as those recently discovered on Ceres and on Saturn’s moon Enceladus. ‘tidalily’ would be a merrier spelling. 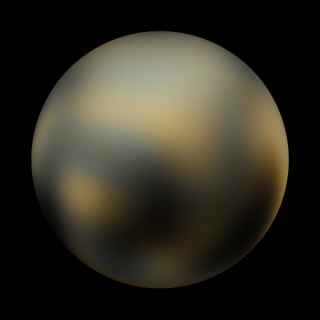 Can’t wait to see what Pluto actually looks like for the very first time, not to much more time to wait!